Amazon Alexa and the Google Assistant-compatibility means illuminating your home is as simple as saying "Alexa, turn on the living room lights." or "Ok Google, turn on the living room lights.". Lumos is the modern "light switch" activated by your voice. Whether it's setting the lights to wake you up in the morning or timing them to signal dinner is done cooking, lighting schedules illuminate your life. And when you're out, Away mode intelligently lights the house to simulate activity inside. Group 2 or more Lumos smart bulbs together in the EufyHome app to control the brightness of multiple bulbs at once. Only same-model bulbs can be grouped together. eufy's smart bulbs are meant to illuminate everyone's life, so giving permission to other users to adjust the lighting is as simple as accepting a request from another EufyHome account. Revoke access at anytime. At eufy, we believe in our products. That's why we back them all with a 18-month warranty and provide friendly, easy-to-reach support. Voice-Controlled Illumination: Amazon Alexa and the Google Assistant-compatibility let you control your lights absolutely hands-free (Alexa and Google Assistant devices sold separately). Access From Anywhere: Whether you're at home or away, control the lights from your smartphone or tablet with the free EufyHome app (Android 4.3 and above or iOS 8 and above devices required. 2.4GHz Wi-Fi network support only). Functional Lighting: Set schedules to automatically turn on and off and enable Away mode to simulate a non-vacant house while you're out. 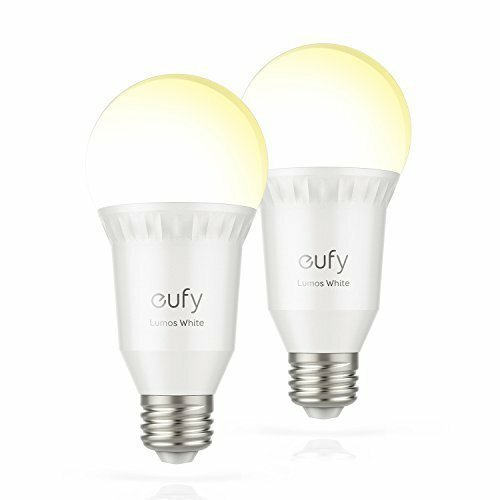 What You Get: eufy Lumos Smart Bulb - White (Product Size: 2.56 x 2.56 x 5.5in), User Manual, Safety Instruction Card, Happy Card and our worry-free 18-month warranty. If you have any questions about this product by eufy, contact us by completing and submitting the form below. If you are looking for a specif part number, please include it with your message.